Introduction: Evidence from studies of implicit motor learning suggest that advantages accrue from discouraging the build up of verbal knowledge about the movements that constitute a skill. The advantages include performance that is impervious to demands present in challenging task environments (e.g., stress, fatigue or multi-tasking). 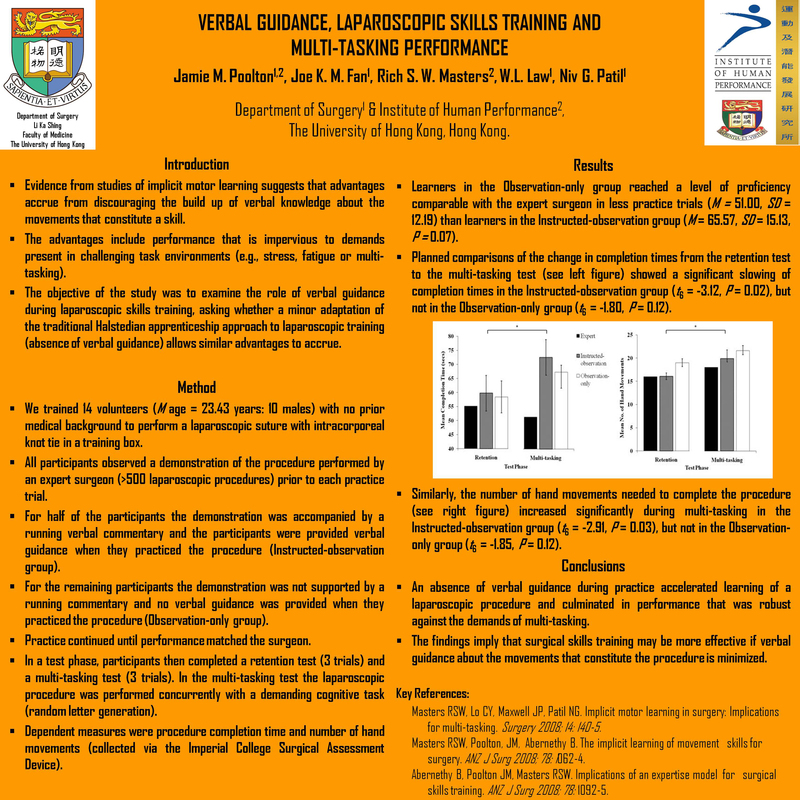 The objective of the study was to examine the role of verbal guidance during laparoscopic skills training, asking whether a minor adaptation of the traditional Halstedian apprenticeship approach to laparoscopic training (absence of verbal guidance) allows similar advantages to accrue. Methods: We trained 14 volunteers (M age = 23.43 years: 10 males) with no prior medical background to perform a laparoscopic suture with intracorporeal knot tie in a training box. All participants observed a standardized demonstration of the procedure performed by an expert surgeon (>500 laparoscopic procedures). For half of the participants the demonstration was accompanied by a running verbal commentary and the participants were provided verbal guidance when they practiced the procedure (Instructed-observation treatment condition). For the remaining participants the demonstration was not supported by a running commentary and no verbal guidance was provided when they practiced the procedure (Observation-only treatment condition). Participants observed the video demonstration before each practice trial and continued to practice until, on 3 consecutive trials, performance matched the surgeon. In a test phase, participants then completed a retention test (3 trials) and a multi-tasking test (3 trials). In the multi-tasking test the laparoscopic procedure was performed concurrently with a demanding cognitive task (random letter generation). Dependent measures were procedure completion time and number of hand movements (collected via the Imperial College Surgical Assessment Device). Results: Learners in the Observation-only treatment condition reached a level of proficiency comparable with the expert surgeon in less practice trials (M = 51.00, SD = 12.19) than learners in the Instructed-observation condition (M = 65.57, SD = 15.13, P = 0.07). Planned comparisons of the change in completion times from the retention test to the multi-tasking test (see left figure) showed a significant slowing of completion times in the Instructed-observation treatment condition (t6 = -3.12, P = 0.02), but not in the Observation-only treatment condition (t6 = -1.80, P = 0.12). Similarly, the number of hand movements needed to complete the procedure (see right figure) increased significantly during multi-tasking, in the Instructed-observation treatment condition (t6 = -2.91, P = 0.03), but not in the Observation-only condition (t6 = -1.85, P = 0.12). Conclusions: An absence of verbal guidance during practice accelerated learning of a laparoscopic procedure and culminated in performance that was robust against the demands of multi-tasking. The findings imply that surgical skills training may be more effective if verbal guidance about the movements that constitute the procedure is avoided.